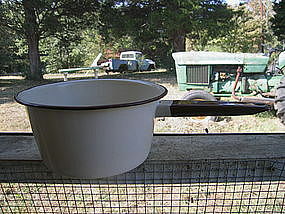 Vintage enamel pan in 2 quart size. It is beige with a brown trim. There is no loss to the enameling, but has some dark marks on the interior from having another pan stored in it for many years. I need your zip code to calculate the postage.